David John Cawdell Irving (nascido em 24 de Março de 1938) é um inglês negador do Holocausto e escritor sobre história militar e política da II Guerra Mundial, com foco na Alemanha Nazista. Seus livros incluem The destruction of Dresden (1963), Hitler's War (1977), Churchill's War (1987) e Goebbels: Mastermind of the Third Reich (1996). Em suas obras ele argumentou que Hitler não sabia do extermínio de Judeus ou, se soubesse, seria contrário. Embora a visão revisionista de Irving sobre a II Guerra Mundial nunca tenha sido levada a sério pelos historiadores, ele foi reconhecido por seu conhecimento da Alemanha Nazista e pela sua capacidade de descobrir novos documentos históricos. Irving marginalizou-se em 1988. Com base na sua leitura do pseudocientífico relatório Leuchter, ele começou a abraçar a negação do Holocausto, negando especificamente que os judeus foram assassinados em câmaras de gás no campo de extermínio de Auschwitz. A reputação de Irving como historiador foi desacreditada quando, ao longo de uma ação de difamação movida por ele contra a historiadora estadunidense Deborah Lipstadt e a editora Penguin Books, foi mostrado que ele deliberadamente deturpou as evidências históricas para promover a negação do Holocausto. O tribunal inglês considerou que Irving foi um ativo negador do Holocausto, antissemita e racista, que "por suas próprias razões ideológicas, persistente e deliberadamente deturpou e manipulou as evidências históricas". Além disso, o tribunal considerou que os livros de Irving distorceram a história sobre o papel de Adolf Hitler no Holocausto para retratar Hitler de forma favorável. ↑ Evans 2001, p. 101. "Leuchter and Rudolf have published pseudoscientific reports purporting to show that chemical residues present in the gas chambers of Auschwitz-Birkenau are incompatible with homicidal gassings." Green, Richard J. "Leuchter, Rudolf, and the Iron Blues" Arquivado em 17 de maio de 2008, no Wayback Machine.. Retrieved 11 September 2008. "The Leuchter Report, a pseudo-scientific document which allegedly proves that Zyklon B was not used to exterminate human beings, was translated into Arabic and sold at the International Book Fair in Cairo in January 2001." Roth, Stephen. Stephen Roth Institute. Antisemitism Worldwide, 2000/1, University of Nebraska Press, 2002, p. 228. "Another common tactic of the deniers is to engage in historical inquiries that on the surface appear legitimate but upon close examination prove to be based on pseudo-science. One prominent example was the investigation of the Auschwitz gas chambers by Fred Leuchter [...] Detailed study of the "Leuchter Report" revealed that it was based on erroneous assumptions (cyanide does not penetrate deeply into concrete). It also emerged that Leuchter had falsified his credentials and overstated his expertise. Despite this, his report is still cited by deniers." Cull, Nicholas John. Culbert, David Holbrook. Welch, David. Propaganda and Mass Persuasion: A Historical Encyclopedia, 1500 to the Present, ABC-CLIO, 2003, p. 168. "... the institute relied primary on the talents of a California-based publicist named Bradley Smith who packaged and promoted Leuchter's discredited material as if it were the very essence of "scientific research" or at least a tenable "point of view," intrinsically worthy of inclusion in the academic agenda..." Churchill, Ward. A Little Matter of Genocide: Holocaust and Denial in the Americas, 1492 to the Present. City Lights Books, 1997, p. 24. "Leuchter's report contained a considerable amount of scientific, or, as it turned out, pseudo-scientific analysis of chemical residues on the gas chamber walls, and similar matters. It was quickly discredited, not least on the basis of Leuchter's failure adequately to defend his findings on the witness stand." Evans, Richard J. David Irving, Hitler and Holocaust Denial: Electronic Edition, Section 3.3c, The 1991 Edition of Hitler's War, Paragraph 13. Retrieved 2008-09-12. ↑ Evans 2001, p. 125. "It may seem an absurd semantic dispute to deny the appellation of 'historian' to someone who has written two dozen books or more about historical subjects. But if we mean by historian someone who is concerned to discover the truth about the past, and to give as accurate a representation of it as possible, then Irving is not a historian. Those in the know, indeed, are accustomed to avoid the term altogether when referring to him and use some circumlocution such as 'historical writer' instead. Irving is essentially an ideologue who uses history for his own political purposes; he is not primarily concerned with discovering and interpreting what happened in the past, he is concerned merely to give a selective and tendentious account of it to further his own ideological ends in the present. The true historian's primary concern, however, is with the past. That is why, in the end, Irving is not a historian." Irving vs. (1) Lipstadt and (2) Penguin Books, Expert Witness Report by Richard J. Evans FBA, Professor of Modern History, University of Cambridge, 2000, Chapter 6. Hugh Trevor-Roper: "But I don't regard him as an historian. I don't think he has any historical sense. He is a propagandist who uses efficiently collected and arranged material to support a propagandist line." Cited in Richard J. Evans (2002). 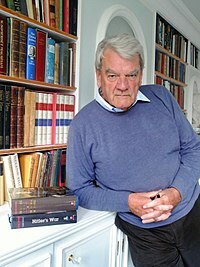 Telling lies about Hitler: the Holocaust, history and the David Irving trial. Verso. p. 261, and Michael Shermer. "Enigma: The Faustian Bargain of David Irving", Skeptical Inquirer, 3 May 2005. Esta página foi editada pela última vez às 14h41min de 9 de abril de 2019.